OHHHH I love this deal since we do alot of entertaining outside! 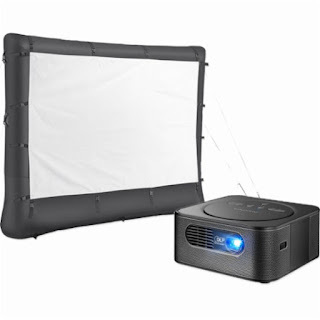 Today ONLY - Insignia™ - Reverb Premium Audio Pico WVGA DLP Projector &amp; 96" Inflatable Outdoor Projector Screen Package for $299.98 (Retail $499.98). Share great sights and sounds with this Insignia pico projector. It lets you project Full HD videos at up to 100 inches, and its built-in Yamaha audio amplifier provides high-quality sound output and standalone Bluetooth speaker functionality. This rechargeable Insignia pico projector runs for up to 120 minutes when fully charged.